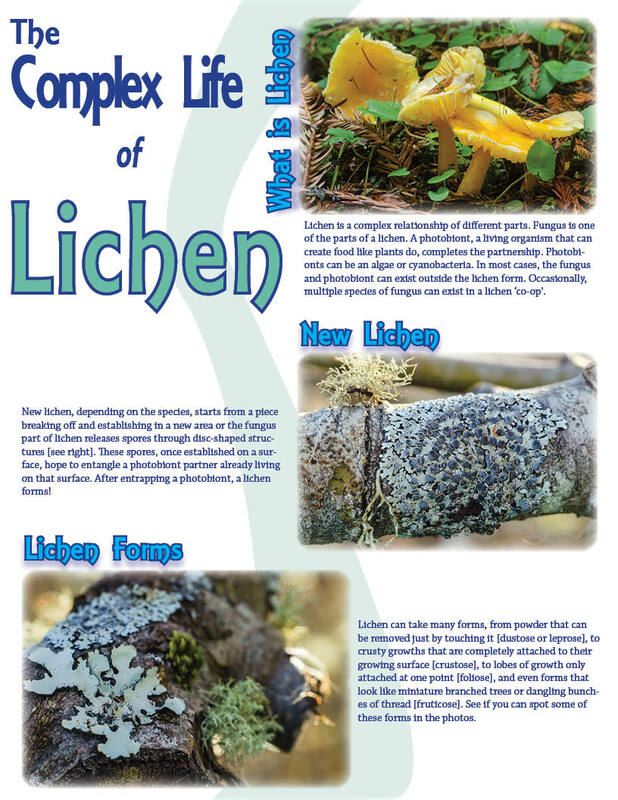 I was just recently introduced to the fascinating world of lichens! So much complexity in such little packages. They are often needlessly vilified and still not fully-understood. Nerd-dom on a sizable scale! Feel free to use at your will. Water is known to be an amazing force. It sustains life, takes life, removes and deposits rock. Yet, with all this power, sometimes the artist behind the work is hidden to us, our perception working like a snapshot of an incredibly dynamic, drawn-out scene. Fern Canyon is usually brimming with water in the winter. By summer, the creek that spans from wall to wall withers down to a trickle, allowing for foot bridges and less of a wet walk thanks to our Marine West Coast climate [or “Csbn” (Mediterranean/summer fog) if you want a more technical Köppen classification. Don’t be fooled, by the way, by the Mediterranean part!! I’m not sure what part of the actual Mediterranean is this chilly; the only part I’ve been to was really, really hot! None of that here.]. The interesting thing about Fern Canyon, as small as it is, is the fact that the walls are vertical [and covered in ferns, although brown this time of year]. Of course, these walls lend themselves to all sorts of ‘myths’ about their creation, the most pervasive being that they are man-made [!]. Again [!][!!!]. According to such generalist sites like Trails.com, Fern Canyon was a result of the frenzied California gold rush and miners using hydraulic rock removal methods [I see a future post on how it’s not wise to fully trust major travel guides [no endorsements from them here, eh?]]. Au contraire! While there were miners present at Fern Canyon and Gold Bluffs Beach, they were never capable of hydraulically mining the canyon due to the lack of dams [they tried and failed]. Oddly, they occasionally focused their efforts on sucking the gold dust off the sea floor, at times thinking its origins were ocean-based and not from the bluffs themselves. Indeed, the tool of choice to sculpt Fern Canyon was water, but by the hand of nature, not man. If you ever get the chance to go, *cautiously* check out the walls, or even the bluffs as you drive out there. They are nothing but pebbles! Sand and pebbles, lightly cemented together, ready to crumble at the first rain shower, or prying finger. Couple this soft ‘rock’, laid down by the ancestral Klamath River, with Home Creek [and perhaps a dammed ancient river that broke through? ], and you get an easily carved canyon. Again, lots of water + soft ‘rock’ = natural canyon! Speaking of water, we were lucky to see some in Sabino Canyon in Tucson, Arizona. Only 12 inches of rain falls a year. Much like Fern Canyon, Sabino Canyon is amazing in that water is the sculptor, but unlike Fern Canyon, Sabino doesn’t have water year round. When it’s time to remove some rock, nature does it violently and quickly, almost like a woodworker wielding a chainsaw, hacking off bits and sending them flying. Walking on the canyon floor, the drama of flash flooding is hinted at by the new restroom facilities [made of stone, replacing the old ones that were washed out–also made of stone! ], broken bits of bridges, and boulders the size of small houses strewn about. As is human nature, people are naturally attracted to peaks. Whether it’s for the good views to survey, a place for reflection, or the chance to add another check mark of accomplishment, peaks and high places have been sought out for thousands of years. 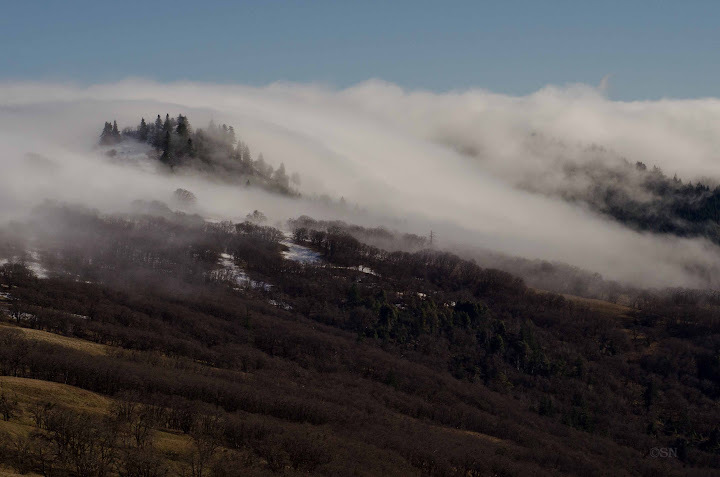 The peaks around these parts of Northern California [more specifically North Coast California], while not high enough to make the ‘best of’ lists, offer lovely views of rolling mountain ranges, the recalcitrant Pacific Ocean, plus a few hidden surprises. The first surprise probably isn’t that fascinating to most, save a few renaissance, jack-of-all-trades types, but it is certainly surprising. I found out about it this way: sitting in the visitor center the other day, an older lady came to the desk searching for some type of mine or quarry. While the existence of such a thing within park boundaries seems feasible, especially considering how young the park is, neither my co-ranger nor I really knew much about it [not to mention, disturbing the ground within park boundaries opens no fewer than 3 cans of worms, proverbially speaking]. Turns out, the peak is just outside the park boundary [not sure about the quarry areas though], but the minerals discovered almost 30 years ago are decently rare and new: Coyoteite, named after the peak, and Orickite, whose namesake is the little hub of Orick. Huh! Speaking of things rare, another peak to the south offers some interesting treasures along the same vein. 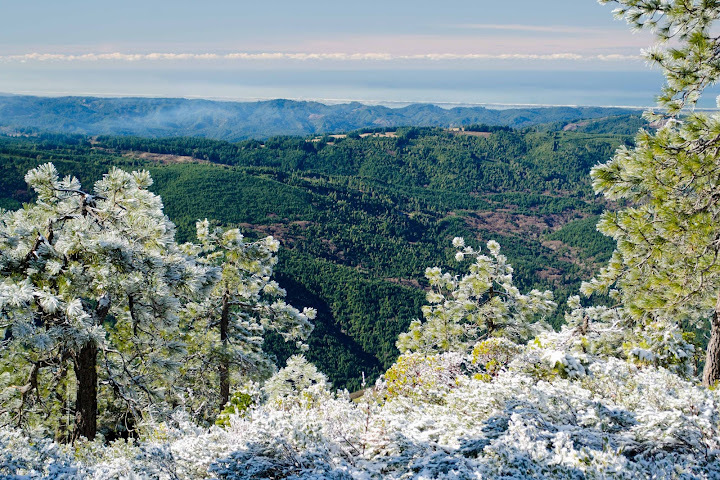 Horse Mountain lies 30 miles from the Pacific, more or less east of Eureka, California, and as one drives up Highway 299 to the peak, a change in vegetation occurs, so much so that Horse Mountain boasts a federal Botanical Area designation. 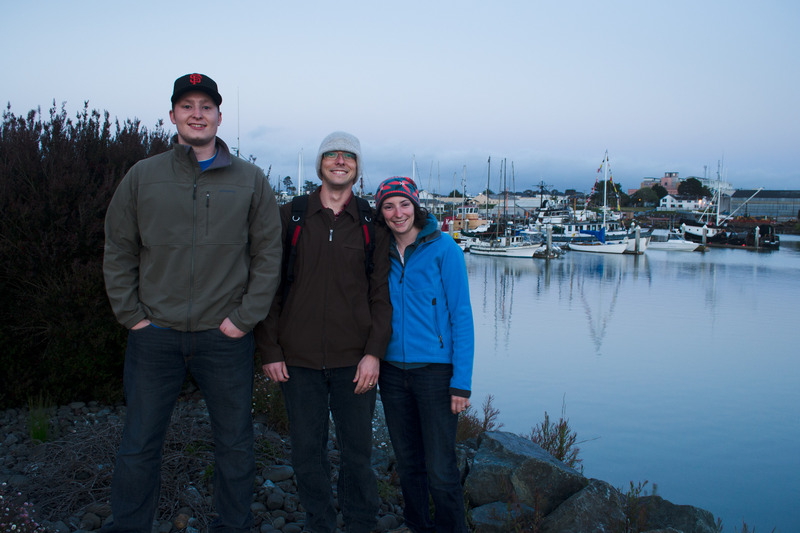 This change is more than just a switch from coastal Sitka spruce that hugs the rocky shore to the redwood and Douglas-fir forests of the gently rolling Coastal Range. The change indeed occurs as the elevation increases, but Horse Mountain is around 4,000 ft–not enough to be alpine or even subalpine, so the difference found on the peak isn’t caused by elevation, nor even climate, alone. This peak has reached through some threshold that the surrounding land couldn’t. As if using a magnifying glass to view the globe, a look at ecoregion [think: bigger than ecosystem] maps offers clues once the finest detailed “level 4” map is consulted. Starting at the grossest view and working down to the finest, the levels start at the Northwestern Forested Mountains of the Marine West Coast Forest, then down to the more specific Klamath Mountains/California High North Coast Range with the Horse Mountain area specifically falling in the Coast Range of that category. These mouthful of words loosely state that Horse Mountain falls just on the border of the Pacific Northwest rainforest type of environment we often think of in coastal Washington and Oregon and the forested mountains of the Rockies. 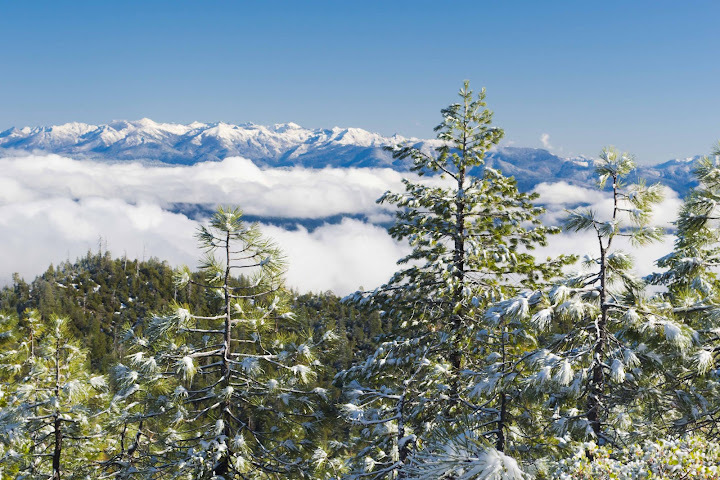 And the Coast Range category points directly at this region in California, but does not define what exactly makes Horse Mountain worthy of a botanical area designation compared to the rest of the Coast Range. The “level 4” map unassumingly calls the area the “Western Klamath Montane Forest”, which does not relate the isolation and uniqueness of this area unless you consult the map and see the isolated dot south of the rest of the occurrence of this region. The designation fails to mention the serpentine soils that sculpt the plant communities and had previously supported a mining operation at the peak. Serpentine isn’t a friendly rock, so thank heavens it’s not more common, otherwise plants would be faced with finding special methods to grow in a hostile environment full of toxic metals. It would be like us trying to live in a house full of carbon monoxide. We’d have to divert energy from developing and growing into coping with the adverse environment. So instead of looking at Facebook, you’d have to spend that time maintaining your breathing unit so you could continue to live in your oxygen deprived world. That’s what the plant community at Horse Mountain is doing. The area receives around the same amount of precipitation as the wet town of Eureka [somewhere around 50 some inches], but the plant community acts like it’s struggling against a lack of water. Among some of the intriguing species, Jeffery Pine, more at home in the Sierras, and Hoary Manzanita, whose family really likes chaparral areas [with frequent fires and 15-39 inches of rain], both call Horse Mountain, and all its precipitation, home thanks to some heavy metal, low nutrient dirt. As interesting as peaks are to the human mind, the peaks of California’s North Coast are like the spires of a royal crown, each boasting natural jewels at the top worthy of being investigated thoroughly. While not every region in this country can point to peaks as their crown jewels, it’s a good bet that each nook and cranky has something unique to only that region nearby. Check out the Level IV Ecoregions map [large PDF–takes a while] and see what’s nearby your home! Summer usually means a lighter wardrobe for most people. The winter coats and mittens are once again stored away and shorts and flip flops take their turn in the prime closet space. For some reason, I could never get used to that switch. I am a pants and shoes kind of person. When I lived in Indiana, Kansas, South Dakota, and South Carolina, I often heard the question “aren’t you hot?!”. Since moving to the North Coast of California, I can now answer that question with a ‘no’! No one will ever ask it though, since most locals sport hoodies and most tourists are puzzled by the lack of California’s signature sunny weather. Roving around in my short sleeve ranger uniform, I’ve been asked by tightly bundled tourists with chattering teeth if I lost my coat. Fourth of July at Woodley Island–Brr! Still, even with the daily highs creeping into the mid-60s and the fog shrouding what would be the scorching sun for most of the day, Summer is in full swing around here. 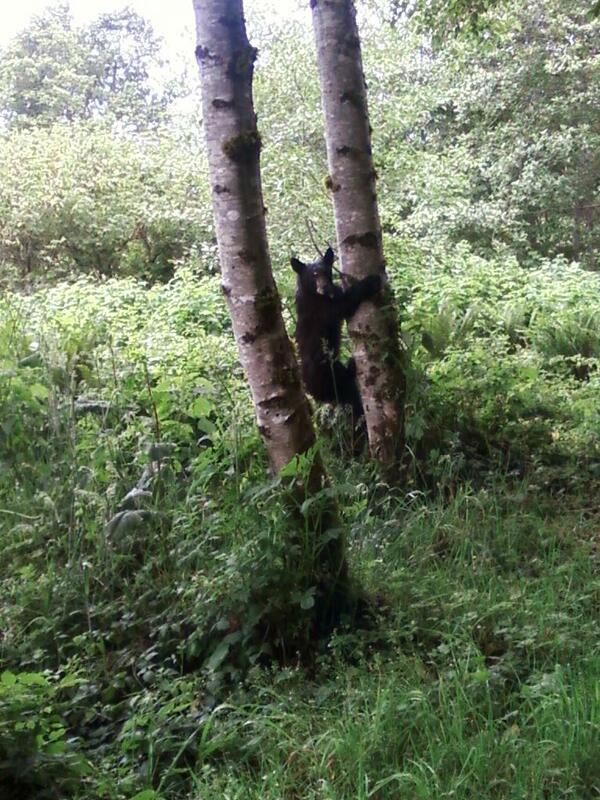 With the influx of tourists, we’ve been receiving bear reports all over the place. One was up at one of our backcountry campsites, so we had to go survey the damage done by unaware campers. Food scraps left are equivalent to slowly poisoning a bear. If the bear’s behavior can’t be changed, then there aren’t many options left if the bear becomes aggressive. The fellow we found looked to be a yearling. He met us at the car, followed us up the 1/4 mile to the sites, and casually munched on leaves as we walked past him. He did a few times half-heartedly jump up a tree trunk as we yelled and clapped at him. He was definitely that sickening melt-your-heart cute and anger welled up in my heart when I thought that someone purposely fed him as I watched him watch our movements for any sign that we would toss him a treat. I think who ever gets caught feeding a bear should be the one to take the call a month later when it rips through a tent to get to human food. They should be the ones to euthanize the bear, that way they know how much that granola bar helped it in the end. Hopefully, there will be fewer sightings of this little guy as the summer goes on. On the same topic of human/wildlife interactions, apparently the mice who moved in this winter or spring had scrounged up enough food to make a litter. We found them in a desk drawer and relocated three of them to a new grassy home. One parent escaped, but the two juveniles looked large enough to be on their own. They were sincerely reluctant to exchange the cozy shirt they found for a grassy, snake-ridden maze. Other juveniles are striking out on their own and discovering the world, too. 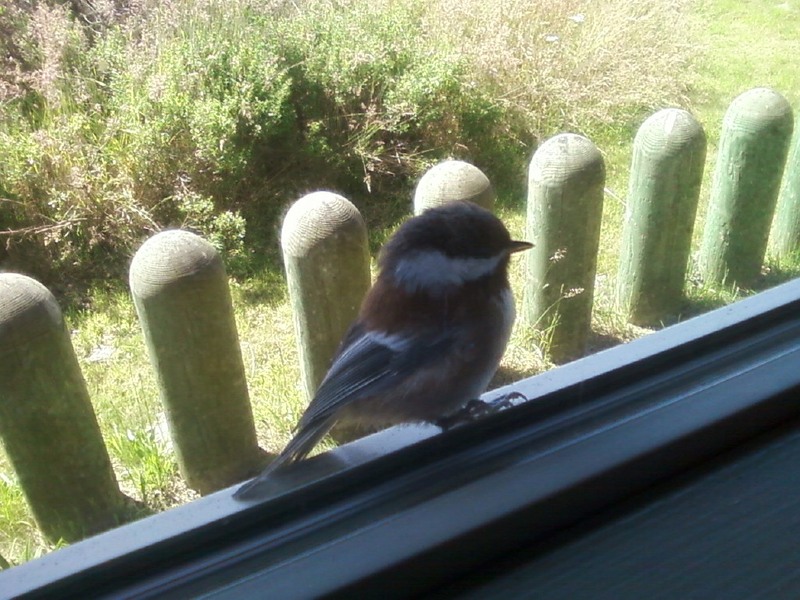 This Chestnut-backed Chickadee was trying to comprehend the neck-breaking magic of glass windows, the whole time peeping loudly to its nearby parents. The Fourth of July week brought a flood of visitors, including a larger than usual beach-going crowd that for some reason couldn’t get along peacefully with the pelicans. 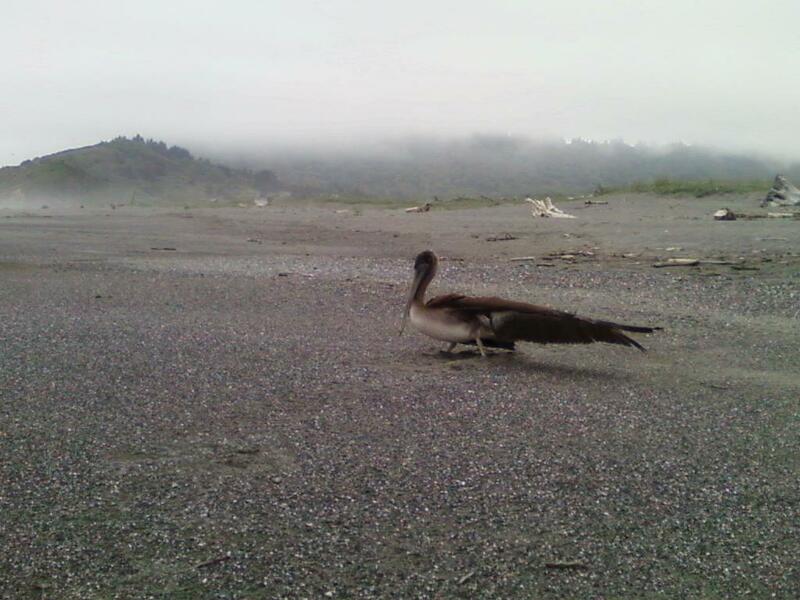 The day after a pelican incident, we received a report of an injured pelican south of the visitor center. Since my rove time at Lady Bird Johnson was foiled by an overflowing parking lot, I set out to find the bird. When I found him, he looked exhausted with his eyes half way closed and head resting on his back. I couldn’t quite figure out what was wrong with him, so I snapped some photos and started to head back to the visitor center to report on him. I decided to see if anything was amiss on his backside, and as I stepped over a nearby log, I finally saw his dilemma–fishing line! There was an obvious path in the shape of an arc around the log, making it look like he had been fighting for hours to get free. I phoned for a shirt and scissors, thinking I could throw the shirt over his head without much fuss. Good heavens, was I wrong! After him snapping at a heap of surrendered shirts on the sand, we noticed this fellow was only being held by the evil line by three tips of his primaries. Figuring he could probably fly if only those three were bound together, we managed to cut the line, leaving only an inch dangling off the wing. 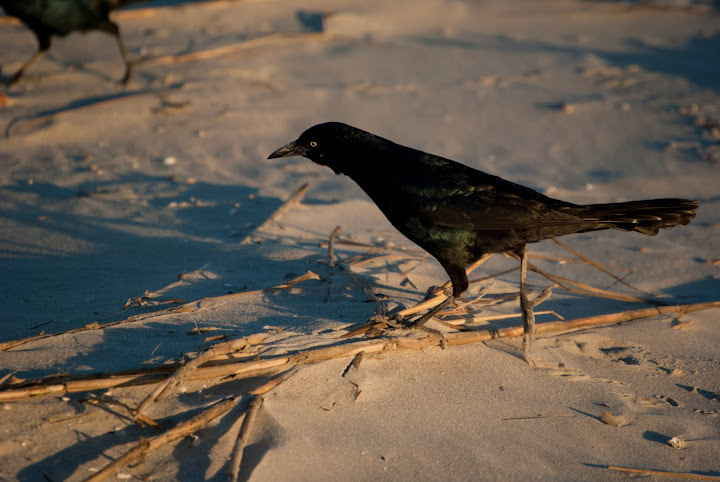 He didn’t fly off immediately, so we put signs up so he could rest on the beach undisturbed. He was gone within a couple hours. 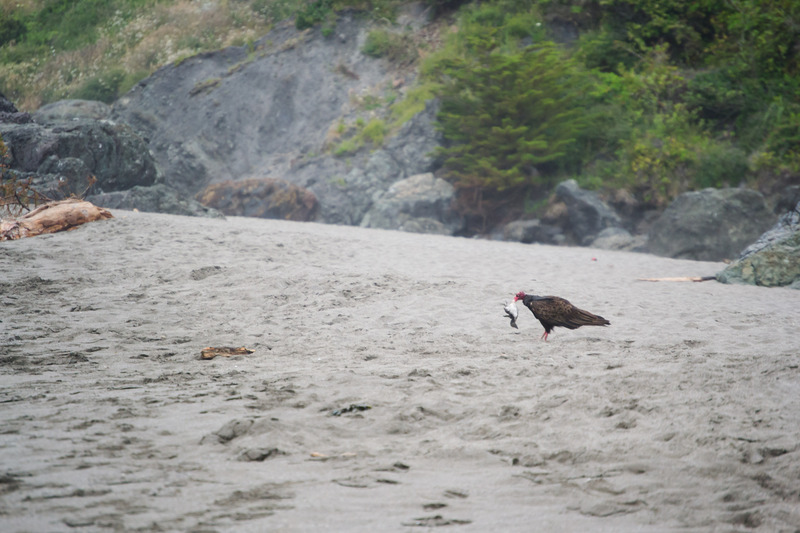 At Trinidad State Beach, the drama of Summer was playing out between bird species. The once steely-gray monoliths are now white-washed sea stacks boasting large and ruckusy sea bird colonies. 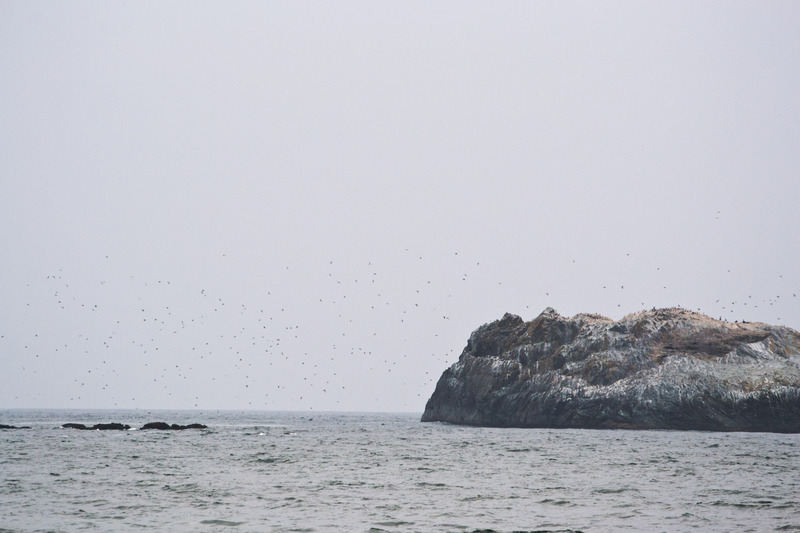 Cormorants, gulls, terns, and murres, whose chicks are apparently just now fledging line the rocky contours. Much to the delight of the local scavenger population, about a dozen murre chicks have washed up on the beach in the past couple days. 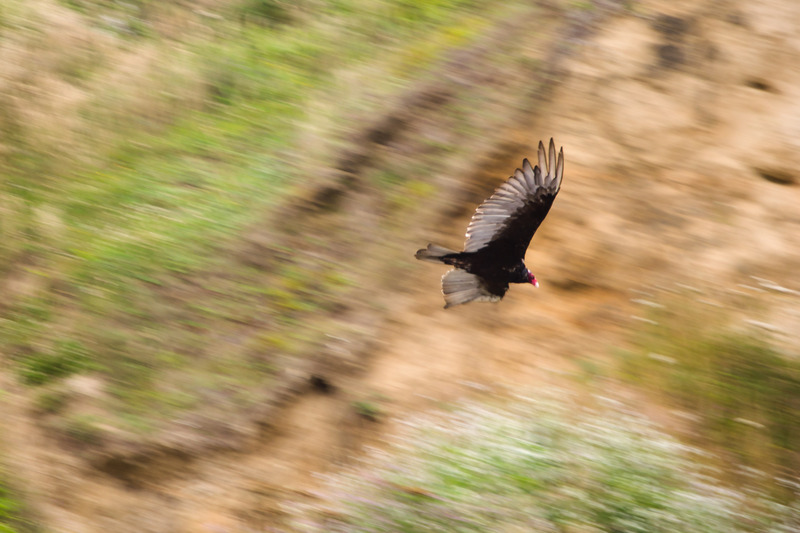 It didn’t take but a few circles for the Turkey Vulture to find its dinner. 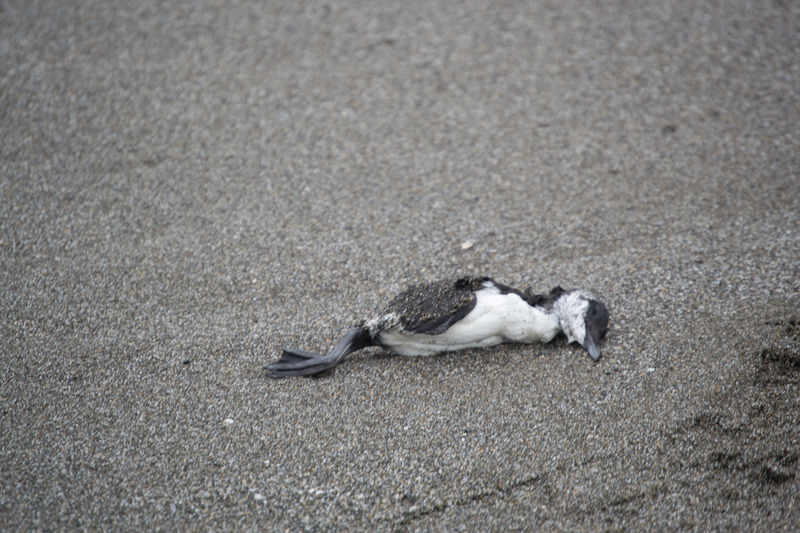 We had just stopped to examine one little murre washed up on the sand. The Turkey Vulture didn’t take nearly as much time was we did to examine the same little bird before starting to work on it. We didn’t watch that scene long and instead headed down the now empty beach, just recently vacated by the coat-wrapped tourists seeking refuge back in their warm rental homes for the evening. While the short-less Summer rolls on without egg-frying temperatures and little sun, we cruise the beach nonetheless, watching the ebb and flow of nature acting out the dramas of Summer. And to look at all beings with the eyes of love. This one takes a little bit of effort for most to love, and unfortunately, I think this isn’t the most flattering end of a sea cucumber. I have suspicions that this fellow is an older juvenile. 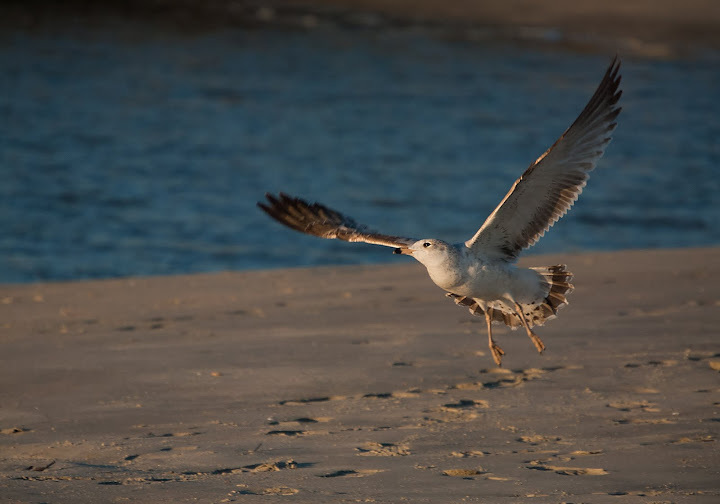 He was walking around with the seagulls, perhaps trying to spot what they were eating, on a treeless, open beach. He looked as if he felt out of place. Perhaps he was just a very hungry adult, but it still is an odd place for a heron. 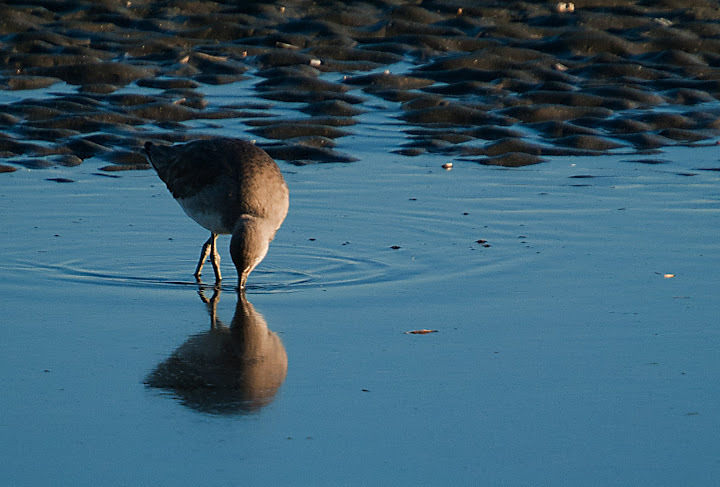 A Bonaparte’s Gull enjoying an evening. I find its name, Larus philadelphia, interesting. Too bad we don’t call it the Philadelphia Gull. Here’s a really neat invertebrate! 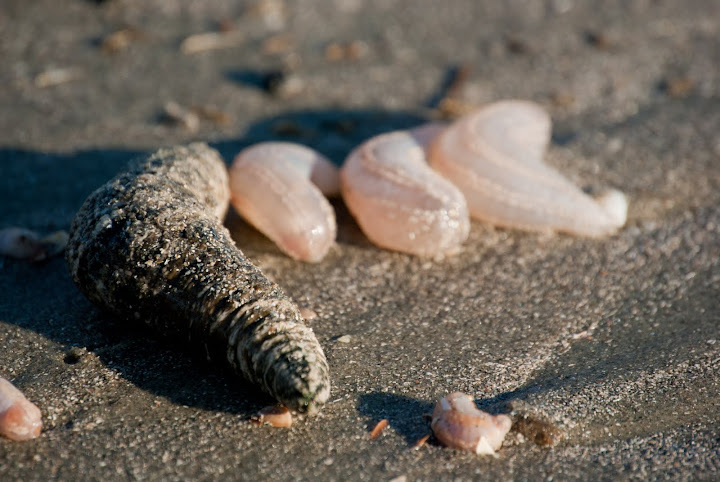 An Ice Cream Cone Worm creates these tubes out of single large grains of sand meticulously pieced together and lives in the tube under the sand. A great little snippet of a website: Ice Cream Cone Worm. I’d like to try this shot with a tripod next time to get the DoF to cover the whole tube, but my husband did a great job holding it! 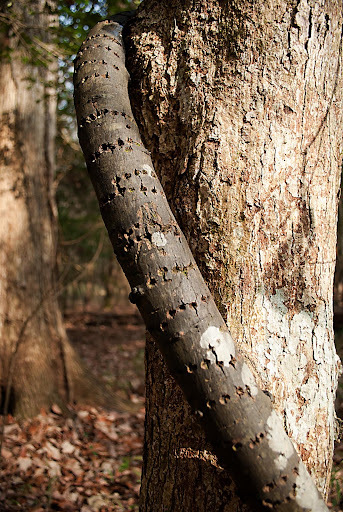 Last shot, from Congaree National Park, is what I believe is the work of a sapsucker on a vine. It made a very neat pattern all the way up the tree, almost like a decoration. Hopefully the Congaree post will come out tomorrow or the next day! 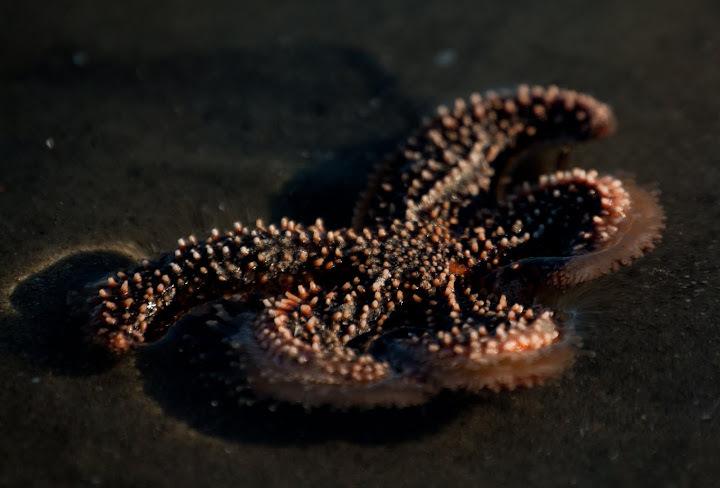 One of the sea star species that we have in this area, Luidia clathrata, the Gray Sea Star, prefers apparently to live in very dense groups, so when the colder water came in early, the cold-shocked sea stars washed up in the hundreds [Smithsonian Species Profile]. Along with them were the less common Common Sea Star, Asterias forbesi, and a few species of sea cucumbers. 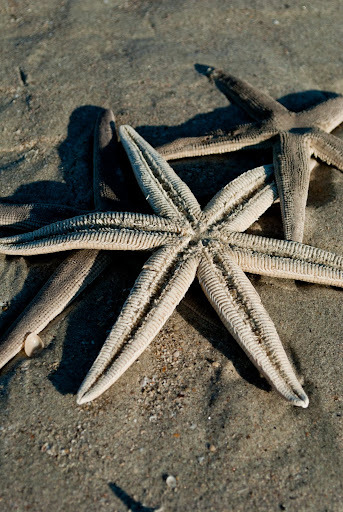 While these species can tolerate water temperatures in the 50s, they tend to migrate to deeper, warmer water during the winter [Echinodermata: Proceedings]. These poor creatures were caught without their ‘coats’ when the cold water came in too early. Above: A pile of gray and common sea stars, arks, and spider crabs. 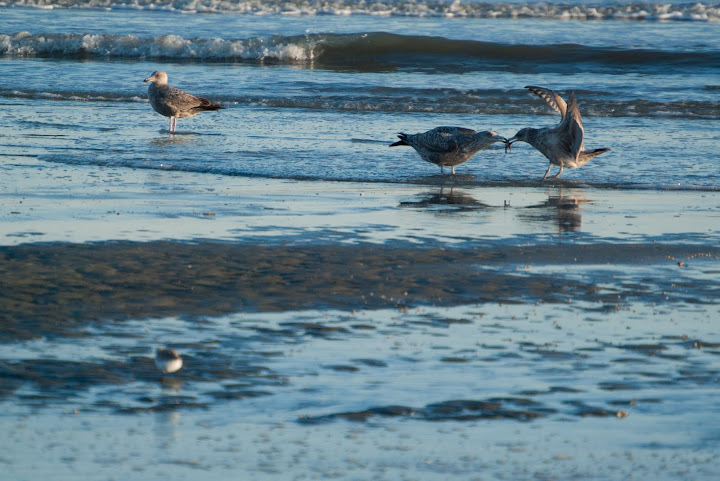 Below: Two sea gulls fighting over a sea star [as if there weren’t many, many more]. 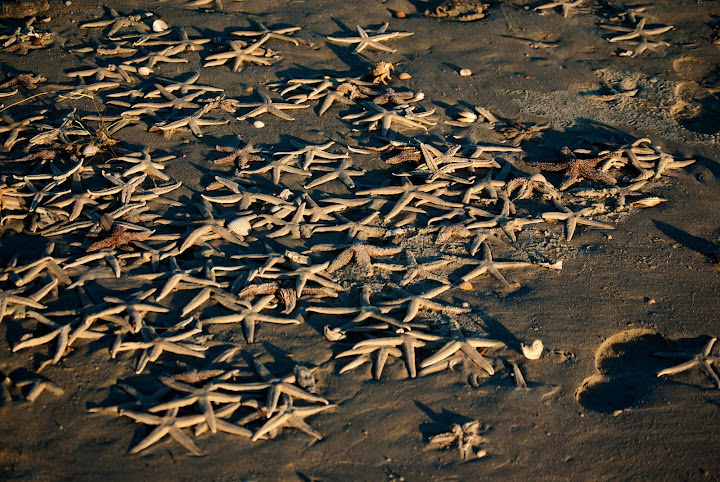 Above: A common sea star left high and dry after an incoming tide. Below: Tube feet reaching out under the water on a partially dried sea star. Above: A sanderling feeding on a sea cucumber. 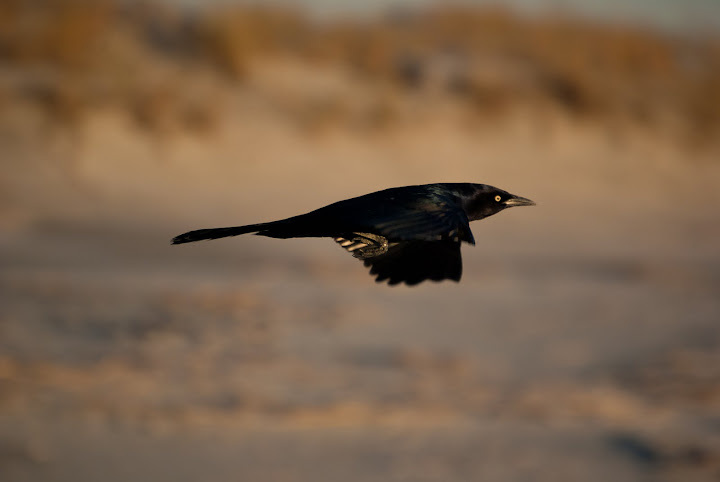 A grackle coming in for an evening snack. 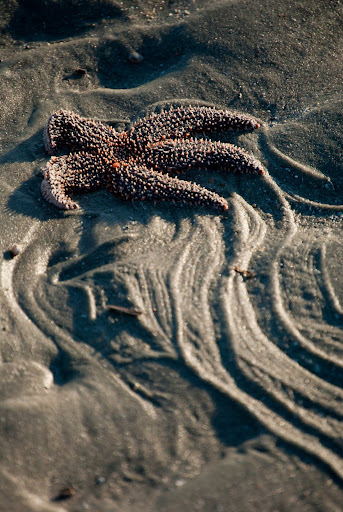 Above: A six-legged sea star. Although it is a tragic sight to see so many creatures essentially die slowly from hypothermia because their tube feet can only carry them so far, so fast, for other creatures it was a blessing to have so much food available during the cold snap. 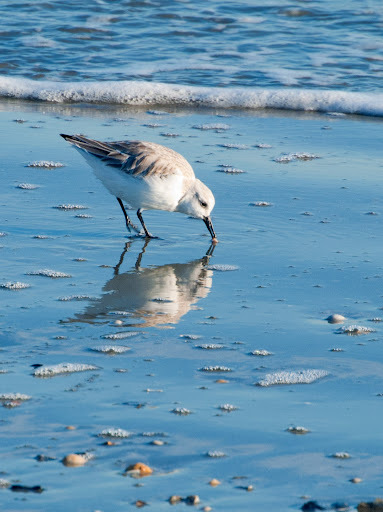 Birds were able to stock up on calories by consuming sea stars and sea cucumbers that, ironically, were too cold to find the food that would supply the calories to survive. I don’t get out and photograph as much as I’d like to in this lowcountry heat. A string of days with heat indices in the 100s [think 110 to 125] makes anything outside a bit of a chore. But while running between oases of air conditioning, I have managed to snap a few photos this summer. People aren’t the only ones to feel the heat under the grueling Summer Sun. Many creatures take cover out of sight, making them more difficult to spot, especially when the Sun is at its highest. This is especially true for the alligators and deer. Some creatures, the smaller ones, don’t seem to be bothered by the boiling air. 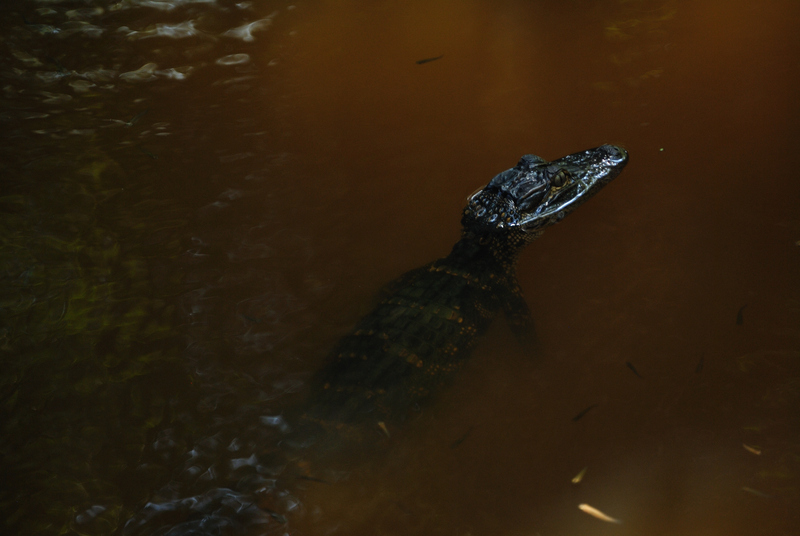 This fellow seemed to love the mid-day heat, but not my camera in his face. 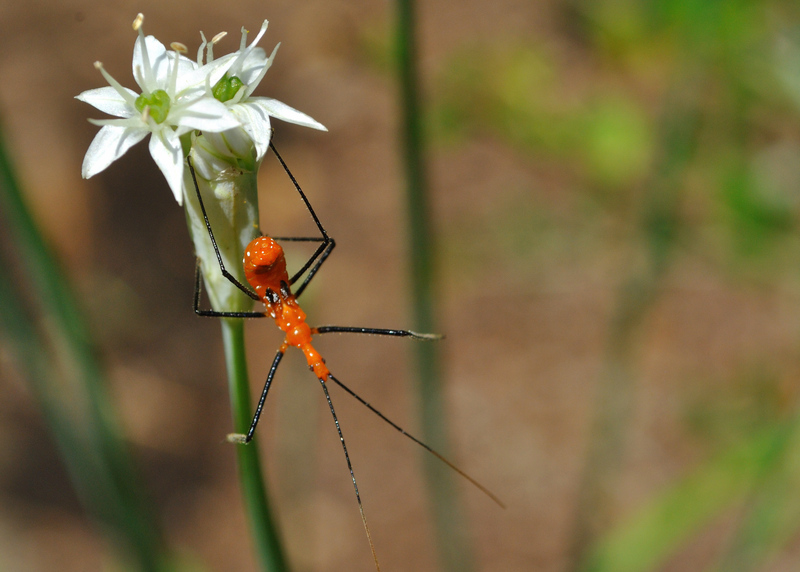 Probably hunting for other insects, this Milkweed Assassin Bug was perched just below the flower with his head facing upward. Either the wasp or my camera spooked him into what looks like a get-out-of-here wave. Though not visible in the photo, this bug has a long proboscis, used to pierce any bug without protective armor that happens too close. This little fellow, perhaps hiding from direct sunlight, was perched prominently on a leaf, though a few visitors missed seeing him. 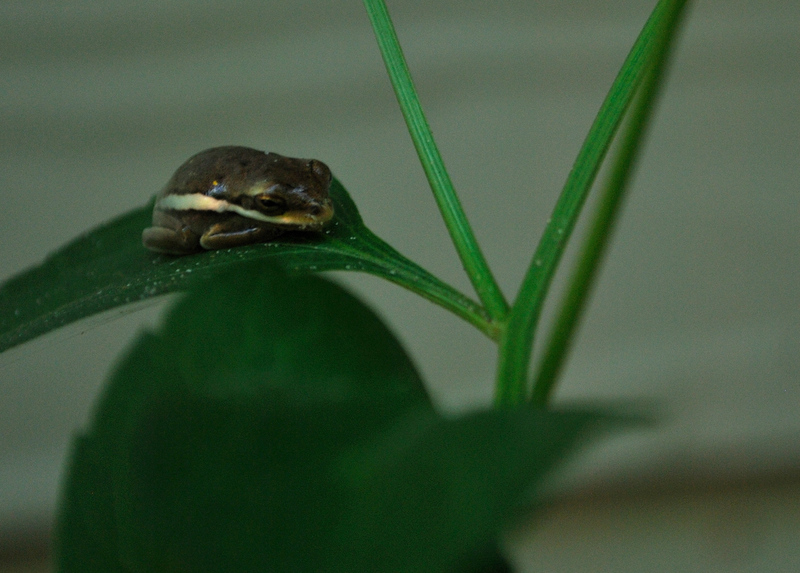 I still can’t pinpoint his name, but I think he’s a brown green tree froglet. 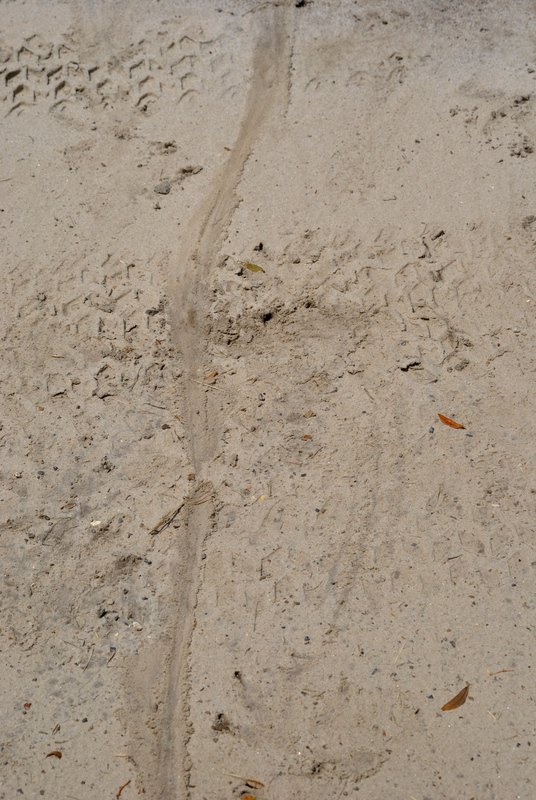 If you look closely, you’ll see not only where the tail scraped through the dirt, but also the claw marks and where the alligator lazily dragged its feet between steps. Mud dauber nests are so neat, unless of course, you are a spider. The wasp-relatives hunt the spiders down, paralyze them with a sting, and then encase them in the tombs for hungry mud dauber larva to eat. Though a spider’s worst nightmare, mud daubers aren’t a threat because of their non-aggressive, just curious, nature. 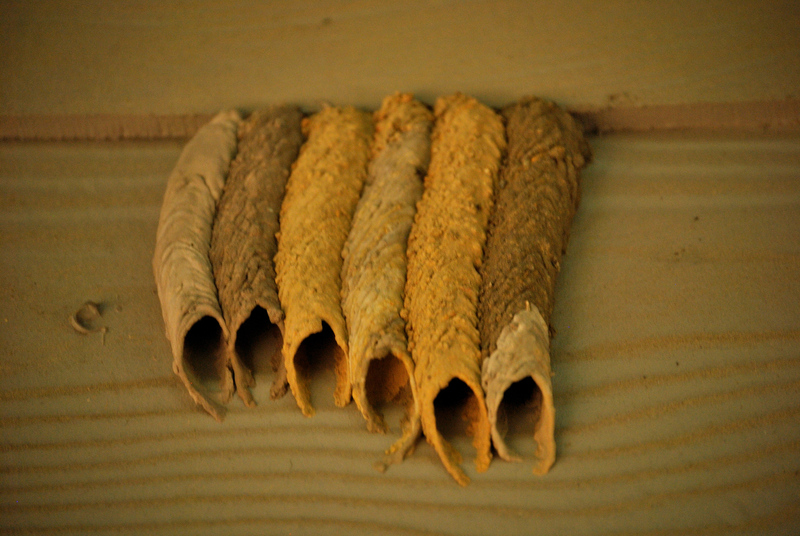 The difference in colors comes from the different sources of mud that the dauber visits. My guess is that the grey on the left comes from the parking lot, the brown from the swamp, and maybe the yellows from some of the higher trails around the area. Pretty neat to think about!